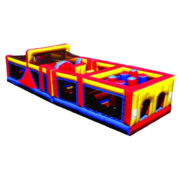 If you're looking for obstacle course rentals in Tacoma or the surrounding areas, you've come to the right spot. We are incredibly excited to roll out our Radical Run Mega Xtreme Challenge. This giant inflatable obstacle course is 95' long, and could just about be seen from space. 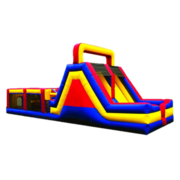 If you're ready for your guests to have an amazing time at your next event, this monster inflatable will not disappoint. Great for all ages. 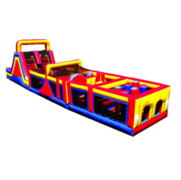 If you're looking for the fun inflatable obstacle courses but available space is a factor, take a look at our Tunnel Slide Combo II. 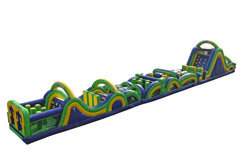 The perfect obstacle course for a backyard bash. With it's 20' x 24' footprint, this obstacle course will be the "perfect fit". 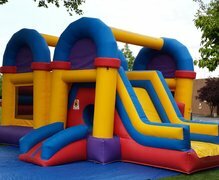 Also, don't forget that our concession machine rentals and interactive games make great additions to any event. Browse the selections below and click on the title or image for more information and to make a reservation.